Squall still number one which is good. Right now the top 10 are pretty good choices except maybe Eiko and Lightning which I don't really care for. I kind of wish Laguna and Zell hit the top 10 but I have good passives already so I can wait until they get easier options. I'm planning to do a big crystal grind so that I can awaken and get the rest of the characters max level this weekend. My Rinoa and Quistis gem stash is currently 135170 with 184 tickets. I still have to finish a couple stages so I have even more gems to grab. Squall being number one is bad because he won't return to relevance until long after Eidojas are already permanent. I haven't looked too much into Agrias but I love Tactics so I'll spend a few tickets to get her stuff. He is still heavily used by many people even if he isn't as game breaking as he used to be. A lot of people who pulled him want an easier chance at getting good passives so he is leading so I think it's completely fine plus he isn't the only one who will receive Eidojas by winning. Most likely the top 5 or 10 will. Tifa's level 70 rework and EX + look so amazing. I'm glad she will be good! The QUEEN is coming. 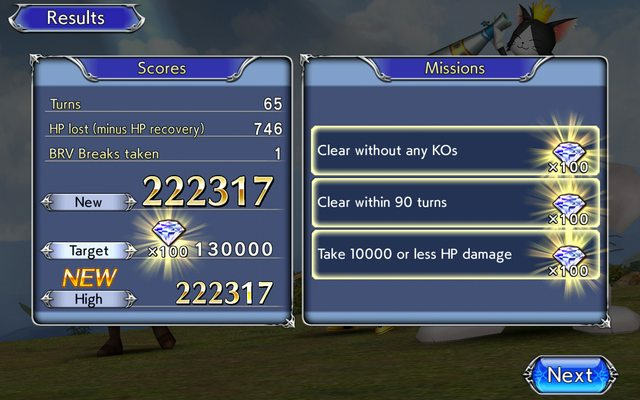 Tifa EX+ hitting for over 100k, with her fists, is gorgeous. Barret looks like fun too. Am really excited for him to finally get here! 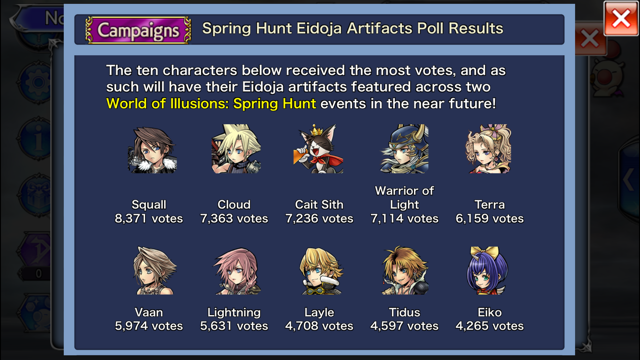 Yeah, he's a wasted vote but I think there are a lot of newer causal players who farm and maybe missed his eidogas the last few times they were featured and easily farmable. There will still be some relevant folks in the top 10 though. Barret best boy. Good thing is EX isn't releasing with him because I'd have to use too many gems. Still trying to recover gems from my failed pulls on the awakening banners. All I heard from Wazzy was :ff8 ff8 ff8 ff8 ff8 ff8 ff8! lol Tifa reigns over all, men and women, blonde brunette. Her own boyfriend wishes he was as cool as her. I can't wait for Rinoa to arrive, she's gonna be a real powerhouse. Yeah I don't want to pit them against each other. They have it hard enough in the fanbase as is. Speaking of VII peeps to come, where the heck is Red XIII?!?! I like to thing they're saving him for another global first; he might not be waifu/husbando, but he is doggo (kinda). Either him or Rikku would be the most likely, if they do it again, I would think. There's not many big names left. Don’t have time to google at the moment but get hair is nearly black right? Like dark brown? What is she classified as Wazzy. My wife is a brunette, they are best! Edit: That's the second time this week my (evil) phone has changed "her" to "get". I am at home now, and thus could google it, but I'm curious to hear Wazzy's reply, so I'll leave it be. 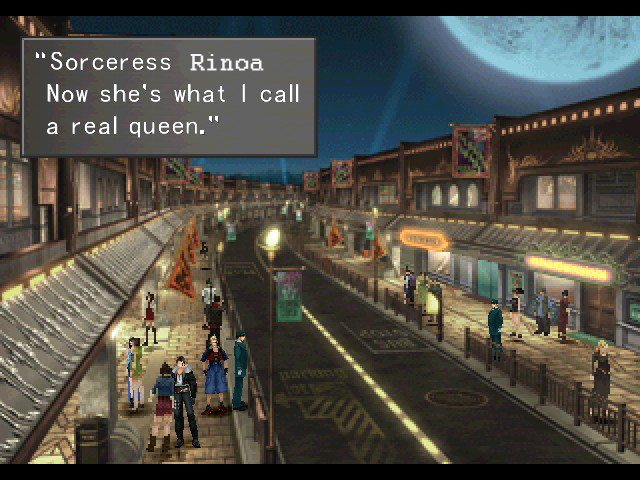 Please, Riona wins by long shot and FF8 is one of my least favorite in the modern games. Now I'll see myself out. Peace out Tifa-lovers. Oh by the way, I meant to tell you guys, I got my POWER TOKEN huge gift last night by killing the specail cactaurs. They were so generous this event. I'm not sure if I should pull for Agrias.... I'm afraid something will happen with an early ex release I want. I have almost no tickets too lol. I blew them all on Rem ex ticket pulling and never got it. Oh well. If it helps, an analysis on the reddit pointed out that the EX isn’t essential, it’s more additive, especially since the silence debuff it provides is only for one turn, so if you wanna pull for her, and get lucky in the other way, getting multiples of her 15 CP and 35 CP, then you’re good to go! I'd try for Agrias, but I'm still saving my gems and I'm also out of tickets at the moment. It looks like she'll become really good in the future though, so there's that to look forward to at least. I'm not sure what I'm gonna do now hmmm. I had planned on a couple multis and her event tickets but I might wait and see. Best of luck to those pulling for her though! I know we had a few here waiting on her arrival. I have almost 20k gems and roughly 50 tickets. FFT is one, if not my favorite FF. So I’ll be doing 2 pulls and all tickets if I must to get that EX. This time I managed to not overspend with rage-pulls, I got Faris and Ashe’s 15CP but both are already MLB, oh well I tried my luck. Agrias EX on second pull. 25k total to get all her gear, done for tonight! Well under budget! Took about 40ish tickets and 10k gems but I was able to get Agrias’ 35cp and EX. I also was able to get Faris’ 15cp MLB’d. Ashe was already maxed MLB’d before the event and thankfully I only got 1 of her weapons during all the pulls. Boy have I been on a luck streak. I'm sure it will end soon. Got 3 Agrias Ex and zero 35cp fuuuuck. When having too much luck is bad. Wow, congrats on the great luck all! ......wow man congrats on the copies for spheres in the future! Gotta resist my urge to pull.. I couldn’t resist and used 65 more tickets, absolutely no Agrias weapons. I’m at 100 tickets now and it’s starting to get dangerous for what I want, but I’m telling myself that with 350k gems hoarded I should be fine for a while. Ok spent a few more tickets than I wanted to snag Faris' 35 CP. Not sure why but, hell why not? Started with 50 tickets and ~20k gems and left with 2 tickets and ~10k gems. This was a good event. Now to level up Aggy and do this EX battle! Good luck to all! I used all my tickets (123) and managed an ex around 40 but since I hoarded specifically for it I used them all up hoping to get dupes for LB. I also got the last copy of Asche's 35cp I needed to MLB her. Didn't get anything for Ferris but that's okay, she's pretty cool but not a favorite. Did 2 pulls and only got Ashe's 35 CP, WoL's 15 CP, and Faris's 15 CP, so I guess I'll keep saving for someone else. I'm still sitting on 150k gems, but I'm saving so that I can spend a truckload on a game-changer in the future, although I don't know who that'd be because I don't keep up nearly as much as I should. I got everything for Ashe and Faris how are they in the current meta and in the future? Worth leveling any of them? About twenty tickets got me one Faris' 35cp, which I already had. Nice! If you have everything, go for both. If you're short on mats/blue high shards, I'd prioritize Faris. She can do a lot of different things for you now and her dispel can be game saving. With that said, Ashe will get a nice rework later that'll give her brave overflow and better buffs along with her EX that can paralyze so she'll move up in the meta when that hits. Probably some time this summer but it's hard to say since global shifts stuff around. Too scared to try this EX stage. A couple good choices. Glad to see WoL, Cloud, and Layle made it; I'll be focusing on them first. Terra was a bad choice. After having used all my tickets and gems to try and get Agris EX, I finally got it after using some extra tickets I got today. Sure some that aren't necessary and are very obvious popularity choices (Squall, Terra, Cloud and Lightning) which I think is completely fine as long as the entire selection isn't based from that but I think plenty of important characters made it. The nice thing is this isn't a temporary thing and Eidojas will come for most characters when they actually need them and not as future preparation. I do wish Selphie and Quistis were able to qualify but it is what it is. Yeah, I think a mix of different things went into the votes. All those characters, with the exception of Cait Sith, have been around for a while and featured several times so folks probably have weapons and levels maxed for them but maybe didn't bother with Eidogas due to the terrible rates. I also think there are more casual players than EX level players and peeps like Squall are more helpful for them than someone like, say, Thancred. Plus some waifu/husbando votes too. The thing that surprised me the most was the number of votes. None of them cracked 10k. Idk, just seems.....low. I would have thought the player base was higher. And done with Agrias Event. Team for EX was Faris/Cait/Agrias/Bahamut/Friend Layle. Just kept bravery up on Agrias and Cait buffed the party once during the inital waves. For boss, swapped out Agrias and summoned Bahamut pretty early on. Beyond that, Faris handled the buffs/debuffs on boss. Super important to have her available when a boss buffs itself, otherwise, someone gets one shot. Agrias stun/silence duty though did save her EX so I could use it right at the start of the boss wave. Did feel a bit lucky on this run stun wise. Had to do one reset before the kill. What are the recommended artifacts for Agrias? Not bad. I'll definitely focus on WoL, Layle, Vaan, and Cloud. Definitely focus on Cloud and WoL, you’ll not regret it when they get their rework. Well, I don’t know about how permanent Eidojas will work so maybe WoL isn’t as important since we got time. It helps that I have WoL fully MLB lol.